Post Tagged with: "Tea Party"
Can Gays Be A Part of the Conservative Movement? 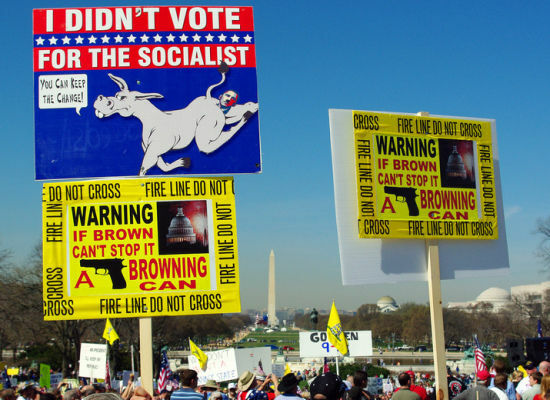 The Tea Party movement, while played up to be about fiscal responsibility, and small government, is really all about social purity first and foremost. That’s why we have seen a number of far right wing hate groups, like the National Organization for Marriage (NOM) pull out of CPAC, the conservative convention because the gay group, GoProud is a sponsor. Who Do You Want to Run Our Government? ssues like START, the destruction of the Constitution, and the elimination of social programs are the real goal. The rhetoric around smaller government and fiscal responsibility are just the empty words used to invigorate the voters and create a media spectacle. We are losing our country to these crazies, and we need to realize it before it is too late. We want a few rights while they are destroying the very framework upon which any of us (all of us) have any rights at all. Anyone who thinks that the Tea Party Movement is simply about fiscal conservatism, need to take a step back and really look at what the Tea Party, and those pushing it forward are all about. How Rough Will the Battle Be For LGBT Rights? The linked blog post on the Huffington post was actually about Health Care Reform, and is a good read on that subject, but a photo on the post really captured my attention, and prompted me to step back and think about the bigger picture.